“Carry on talking” I tell my family, “so I can see if I can understand you”. My sister pipes up, “The dog keeps farting”. My switch on video isn’t online. I’ll tell you what happens though. I’ll write it down here. I look a bit like an LSD volunteer from one of those 1960s scientific experiment films in my activation footage. The audiologist finishes the initial tuning and says she will switch on my processor now. At that moment, my mum is signing, “Shall we recite some Shakespeare?” She doesn’t. The switch on happens in stages. I laugh at my own voice. I look like I’m having a ‘far out’ party in my head. I’m struggling to find the words to describe the rapidly evolving, crisp robotica soundtrack that only I can perceive. I say, “Carry on talking, so I can see if I can understand you”. My sister pipes up: “The dog keeps farting”. That’s my big switch on moment. “The dog keeps farting”, and in the video I look down at my mum’s Hearing Dog, disappointed at her lack of occasion. I’ve been going all the way deaf for 20 years and that’s the best you can do, dog? Call yourself a HEARING dog? Maybe she felt threatened, so resorts to detonating pre-emptive terror-stink strikes. She farts silently and scratches herself rhythmically -like a disinterested jazz percussionist from another (robot) world. At my switch on I still had to lipread everyone. I couldn’t understand them without repetition. However I felt massively relieved that I could hear ANYTHING. I knew that switch on was always the “worst day”. But it seemed pretty fun to me. And in the footage I try to describe what I’m hearing to the people in the room, I say my mum’s voice is like an electronic bleep dripping into water. My voice was a C3P0, a Sophie and a darlek all rolled into one and I explain that I’m speaking in a tin room and everyone else is very far away. My family and friend were quite incomprehensible through the barrage of special effects set off by my brain as it improvised squelchy, bleepy electronica off the back of the new input. Then I describe to my family how my voice is already starting to sound recognisable to me. And my sister tells me this is good, it’s fast progress. I remember thinking; maybe we can start to feel hopeful now! It’s working! Then I try to look away when my mum speaks, to test if I can hear without lipreading. But she stops speaking every time I look away. We are laughing, it’s impossible! My mum says, “It’s deaf culture, if you look away, I stop talking!”. So the audiologist starts speaking to me instead, with me telling her how much I can understand, and she gradually ups the volume. Then the video stops. I felt rather daunted at that moment. Everyone was hard to understand on the first day. Now, 8 months on, everyone is pretty easy to understand. After switch on, my mum, sister Cathy, friend Kate, the dog and I walk to the park nearby. I phoned my husband at work. Incredibly he sounded like him for a few seconds before his voice pixellated into a white noise of squelchy bleeps and we had to hang up. I was amazed. I was totally deaf but now I could hear on the phone. Before my surgery people told me not to fixate on switch on. It’s the worst day in the process. But I went through a phase of googling for CI switch on videos where you can see a light go on in someone’s head. I didn’t find very many. The switch on begins with several minutes of listening to nothing but hearing test type bleeps at different frequencies, and that contributes to a sense of boring anti-climax. Your ‘first ever’ noise is an audiogram style bleep. And then you can’t understand much of the ‘real world’ right away, because your brain isn’t used to the implant signals yet. It’s kind of frustrating. I wanted the audiologist to carry on tuning me for hours. But we had to give my brain time to learn to work with the CI. 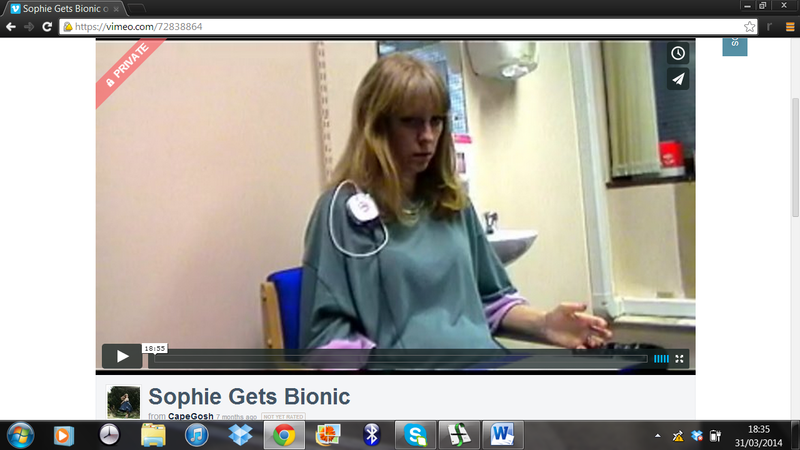 Watching switch on videos on YouTube in the months before surgery didn’t help me. They made me cry. I realised I was torturing myself because every time I watched someone have a successful switch on, I told myself that that would NEVER be me. My CI wouldn’t work. It worked for them but mine would probably fail. I had no scientific proof that it would fail, but that’s what I’d decided. Then I decided to stop watching the videos and embark on a series of healthier, more constructive activities which allowed me to escape that old devil called ‘self-destructive anxiety loop of doom’. Maybe I should post my switch on video online. Maybe the hearing dog farting, and mum refusing to speak to me unless I looked at her, and me not really hearing what anyone is saying, maybe these things will help someone, somewhere one day in some way. But I prefer to write about it instead because I know how to tell it.